I've been having pain in my wrist and hand for a while. My doctor and I are trying to determine why (carpal tunnel syndrome? arthritis? ), so I went for an x-ray a couple of weeks ago. The x-ray technician positioned my wrist just so, then went over to a desk to get a little sticker to place next to my arm to show that it is my right wrist. I sat comfortably, keeping my wrist just as she had positioned it. Then, after placing the sticker next to my arm, she said, "Try not to move now," as she went around the corner to take the x-ray. Suddenly I felt tension, as if I had to concentrate really hard on not moving, even though before she spoke I had been perfectly relaxed and still. It immediately made me think of all the times I've been using my debit card at a store and the machine screen says, "Processing Do Not Remove Card." I always feel like I want to yank the card out as soon as I see that screen! Please tell me I'm not the only one! Obviously, the apostle Paul struggled with the same tension over obeying commands. Paul wrote, "I would not have known what sin was had it not been for the law. For I would not have known what coveting really was if the law had not said, “You shall not covet.” But sin, seizing the opportunity afforded by the commandment, produced in me every kind of coveting" (Romans 7:7,8). It's not that there's a problem with the law, Paul explains, just like there wasn't a problem with the x-ray technician telling me not to move. The sinful nature that lives in us is the problem. That sinful nature, which is always at war with what God wants, immediately jumps into action and brings to mind all the ways we could break the command. Suddenly, the thing we are not supposed to do becomes exactly what we want to do. Later in that same chapter, Paul laments his struggle with sin in what is one of my favourite parts of the Bible (seriously!). I love this passage for two reasons. The first reason is not at all spiritual - I'm a writer and I love words, so the way the first part of the passage is written amuses me to no end, even though the meaning is not amusing. A word of advice: read it slowly, pausing whenever you reach a comma or a period. You may even want to read it a couple of times to help you get past the repetition and really grasp the meaning. "So I find this law at work: Although I want to do good, evil is right there with me. For in my inner being I delight in God’s law; but I see another law at work in me, waging war against the law of my mind and making me a prisoner of the law of sin at work within me. What a wretched man I am! Who will rescue me from this body that is subject to death? Thanks be to God, who delivers me through Jesus Christ our Lord!" (vv. 15-25). The second reason I love this passage is the meaning. I love that Paul, a man we may be tempted to think was nearly as perfect as Jesus, is so honest about his struggle with sin. The very things he knew were wrong - he did them! Just as we struggle, he struggled. I don't know about you, but I find it comforting to know that God can use a person who struggles with sin. Of course, the best part about the passage is not that Paul struggled with sin, but that he has been delivered through Jesus Christ. 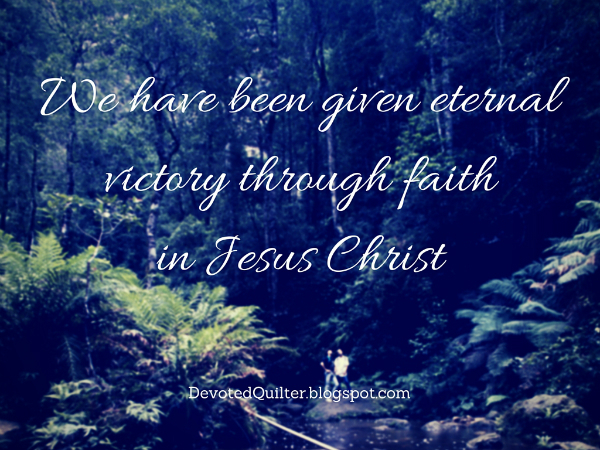 Though we will continue to struggle with our sinful nature, we too have been given eternal victory through our faith in Jesus as our Savior. No matter what commands we have been given, or how we struggle to obey them, we know that, through Jesus, God "has rescued us from the dominion of darkness and brought us into the kingdom of the Son he loves, in whom we have redemption, the forgiveness of sins" (Colossians 1: 13, 14). I hope your wrist gets better. I have had trouble with my left wrist for years ever since I pulled something in my wrist/hand when my oldest was a toddler. Then I broke my wrist in September and it was in a cast / brace for 5 weeks and it is actually better than ever now. I think that the 5 week rest helped the break and whatever was straining my wrist. Sorry to hear about your wrist. I hope they figure out the problem soon and that you're on the mend soon.